Computational heart-tissue models envelope the solution of non-linear partial and ordinary differential equations. After applying certain discretization methods (finite difference, finite elements) to them for its solution, result in a set of operations between matrices in the order of millions. The outcome of this are programs with high execution times. The current work simulates a human atrium tissue using the Courtemanche electrical model . The cell pairing is made using the finite difference method and its computational implementation was made using the Armadillo C++ library , for the CPU version and the acceleration was made through the CUDA library  on a nVidia Tesla K40 card. Additionally the visualization process was made using Paraview-Catalyst , two computing nodes permits that the execution process of the numerical method runs on a node while the other node makes the visualization simultaneously. A novel process to make atrium human visualizations was implemented, a 200X acceleration was achieved using CUDA and Arrayfire . 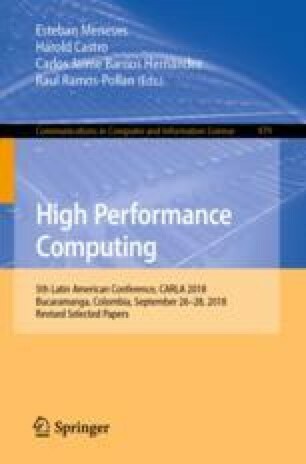 The authors thank the nVidia company  for supporting the GPU Education Center of the Universidad Tecnologica de Pereira which is managed by the research group Sirius, part of the Systems Engineering program .